Go to bed in Paris, wake up in Rome—terribly convenient. Maximize your time and money in Europe by making any train trip over six hours an overnight ride. One of Europe's greatest sleeping and travel bargains is the overnight train couchette. For just $20 you get a bunk in a couchette and you wake up the next morning in your next destination without having wasted a day getting there. Though this isn't the most comfortable night's sleep you'll have, the price and convenience is hard to beat, and there are even ways to do it for free. Sitting up. This is a last resort; you won't get much sleep. Fold-out seats. 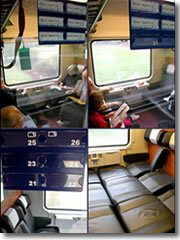 Old-fashioned trains in Europe consist of compartment cars. Each private compartment has two rows facing of seats (three in each row), a picture window on one side, and a door to the corridor on the other. How to ensure you won't get booted out by someone who legitimately booked the seat you're considering? Outside of each couchette is a little plastic window where bits of cardboard are inserted if someone—could be someone getting on at this stop, could be someone from a station further down the line—has reserved a seat. Check to make sure you're occupying an unreserved seat before you claim the couchette. In the series of photos above, the compartment in the upper left is fully booked , so forget it. The upper right has only two seats available—fine if you want to sit, not if you want to sleep. The lower left compartment, though, is not only obviously empty right now, but no one has booked a seat in it, either. That's your signal to pull out all the seats (as in the lower right photo), shut the curtains and the light, and start guarding your free bed from all comers. Privacy isn't guaranteed, so as soon as you find an unoccupied couchette, pull out all the seats, close all the curtains, turn out the lights, and lie down as if asleep—even if it's 5pm. Hopefully, potential roomies will pass your couchette by in search of a more inviting one. One final, and sadly discouraging note: this seat-pulling is a method that gets more difficult to pull off with each passing year. Slowly, these old-fashioned compartment cars with little rooms of six seats each are increasingly replaced by trains consisting of boring, modern open cars with parallel rows of seats (you know, like on Amtrak or your local commuter rail). Flip-down bunks. This is always my first choice. Sleeping couchettes allow six to sleep in minor discomfort on narrow, flip-down, shelf-like bunks. You get a paper-thin sleep sack, a blanket, and a "pillow" that somehow manages to make the spot you place you head flatter than if you didn't use it. In a sleeping couchette, the doors lock, the conductor keeps on eye on your car, and at around $20 to $30 for a reservation, it's one of the cheapest sleeping deals in Europe. Unless you reserve an entire couchette, be prepared to share your room with up to five strangers. A berth in a sleeping car. 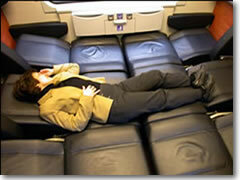 Usually this is only a first-class option, where you get a tiny room with two to three bunks and a private sink. It's more expensive and a smidgen comfier than a couchette. Strangers may populate the other bunk(s) if you're alone. With either a couchette or a sleeping berth, if you're crossing an international border, the conductor will take your passport when he comes around to cancel your ticket or pass. This is so the border patrol can sift through them all quickly when you cross at 3am, and you won't have to be woken up. Don't worry; you'll get everything back in the morning, and it's probably safer in the conductor's care overnight than it would be on your person. On overnight trains, always request one of the uppermost bunks. Yes, the top bunk can be hotter, but it has its advantages. You can keep a closer eye on your luggage, which you stuffed securely into the niche above the doorway (and then prudently strapped to the low railing that's there so a thief can't quickly pull it down in the middle of the night). You and your moneybelt (which you secretly moved from your waist down to wrap around your thigh—under your pants—while in the bathroom) are pretty much safely out of reach of pickpockets who might slip inside the couchette and rummage for goodies (assuming the thief isn't eight feet tall). Also, since there's no bunk above you, that drunken dude in lederhosen who needs to hit the head at 3am won't step on your face as he scrambles down from his bunk. While we're on the subject, remember: don't flaunt your valuables, and always remember to lock the door when you're inside the couchette, especially after returning from a mid-night stumble down the corridor to the bathroom. Don't be afraid to remind your couchette-mates of this, using pantomime if necessary. I've been in couchettes where this simple rule wasn't followed and some of my temporary roommates awoke to find their unsecured stuff missing (mine was always untouched, strapped into the railings, next to my sleeping head on the top bunk, way up near the ceiling).